Flowering habit at Iao Tropical Gardens of Maui, Maui, Hawaii (USA). May 22, 2012. Habitat: Tillandsia lindenii is an epiphytic plant that grows in rainforests on tree trunks, tree hollows and even rocks and sandy soils. Tillandsia lindenii var. abundans L.B.Sm. Tillandsia lindenii var. duvaliana L.B.Sm. Tillandsia lindenii var. koutsinskava (E.Morren) L.B.Sm. Description: Tillandsia lindenii is one of the most widely cultivated Tillandsias It is a medium sized epiphytic species and has a large showy long-lasting bloom. Tillandsia lindenii are similar to the well known Tillandsia cyanea, but are a bit larger and supposedly a bit more cold tolerant. Rosette: Loose with arching dark leaves. About 30 to 50 cm. in width and uo to 40 cm. in height in the non-blooming state. Leaves: Up to 40 cm long, narrowly triangular, long tapered, about 1.5 cm wide at the base, dark green with red or brown stripes more prominent on the upper side at the base of each leaf. 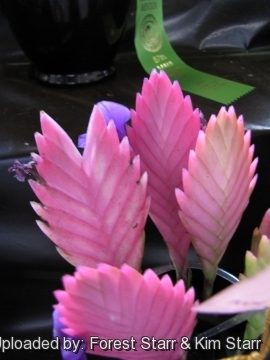 Inflorescence: The flower-scape is a plump blade-like feather that may reach 20 cm long, and is composed of dense, flattened pink bracts from which the large, bluish flowers emerge . 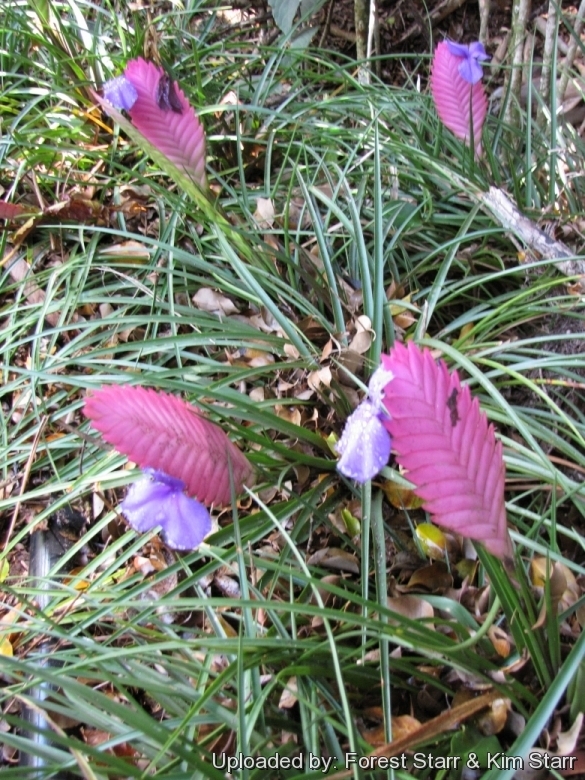 Tillandsia lindenii is considered to have a "paddle-shaped inflorescence" by bromeliad collectors. Flowers: Pansy-shaped, white-eyed, deep purple-blue with three spreading petals, that appear successively along the edge of the spike between the showy bracts, 1 or 2 at a time, for long periods. Some have a cinnamon-clove fragrance especially in the morning. Remarks: A closely related species, Tillandsia cyanea, is smaller up to 30 cm tall and differs somewhat, including that its flowers are (usually) not white-throated and the paddles (inflorescences) are differently-shaped, more blunted, elliptical shaped and with a shorter scape than Tillandsia lindenii. 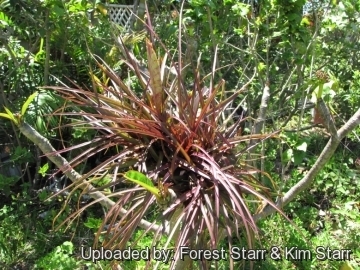 1) Forest & Kim Starr “Tillandsia lindenii (Air plant, tillandsia)”. Plants of Hawaii. <http://www.starrenvironmental.com>. Downloaded on 20 August 2014. 3) Wikipedia contributors. "Tillandsia lindenii." Wikipedia, The Free Encyclopedia. Wikipedia, The Free Encyclopedia, 6 Jul. 2014. Web. 18 Sep. 2014. Cultivation and Propagation: Tillandsia lindenii is easy to grow, and will thrive within a broad latitude of care conditions. Locate in a well ventilated place. Soil: This species seems to grow faster potted up unlike most Tillandsia which prefers to be mounted on wood or grown bare root. Under these conditions they develop a significant root system, which appears to produce a more robust and prolific plant. Transplant them in spring and, if potted, it must be in a free-draining soil (i.e. leaf mould, peat and sphagnum added with perlite, sharp sand or orchid bark, pH Range 5,5 to 7,5). They can also be grown on slabs of bark or tree fern fibre.